You’ve done it! You’re in a Wormhole with a corp or alliance (be it big or small) and finally ready to do something. Except… well… what do you do? The prelude to anything in a wormhole. Scanning is the foundation upon which all other Wormhole activities lie. If there’s nothing else to do, there is always something to scan. That last scan signature could be a new inbound Wormhole, leading to anything at all. It’s very very easy to get bored of scanning, but if there is nothing else to do then scanning is your bet. This step depends entirely on the class of Wormhole you live in/have scouted, as well as the number of pilots you have online. Most Anoms in lower class wormhole (C1/C2, maybe C3) can be run solo by a careful pilot, but anything more requires more people. A good source of ISK due to salvage/loot, this choice obviously comes with its own inherent risks – anomalies are easy to scan down (not requiring probes) and this means a pilot can be easily jumped. Ladars, Gravs, Mags and Radars are also a good source of ISK. Ladars and Gravs can be cleared very easily by a solo Drake up to and including Class 4 Wormholes (I have no experience with the highers) and the loot/salvage alone can net you a bit of ISK. Radars and Mags can be a bit tougher, particularly Radars. Even if you’re not planning to mine the gas or rocks, killing and salvaging the Sleepers can give your wallet that lovely little boost. Mining the Gas or Asteroids in these sites can take some time, especially solo, so you need to make sure you’re on the ball with your d-scan and ready to run away. Don’t AFK mine these. But you’re bored of this? Well there’s always the solid third choice. You are by no means the only other pilot about. Unless you’re in your home Wormhole with the static unopened and no inbound Wormholes (and you’re scanning constantly to make sure) a new pilot to chase can appear from anywhere at any time. The inactive C3 you were just in can have a whole slew of pilots log in and start mining a Grav the moment you jump out. There’s nearly always something to try to kill if you search hard enough. Patience is the key in hunting in a wormhole. Due to their nature, you never know what else might be about. Watch for people reshipping to something cloaky at a POS (always bookmark observation points on a POS for this reason), use D-scan to judge what site people are at and always check for probes. One day you can get lucky and find a solo Orca and the next day another solo Orca turns out to be bait, and you might just get away. Or not. That’s life. But what if, for whatever reason, you can’t do ANY of the things above? Do you really need an explanation for this one? It’s the big X at the top right of your EVE window. Posted on January 10, 2012, in Wormholes and tagged anomaly, hunting, mining, pvp, scanning, sleepers, wormhole. Bookmark the permalink. 4 Comments. Radar and magnetometric sites are both tougher than their equivalent-class anomalies, and need at least the same sized fleet as for anomalies to think about warping in to one. 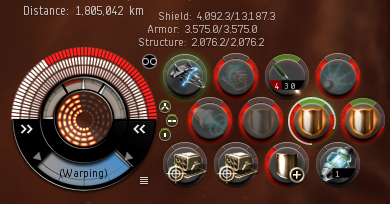 I’ve seen solo strategic cruisers destroyed by the Sleepers that spawn in C5/C6 ladar sites. They can be rough. And even if your scanning ends in k-space, you can always scan that system for more wormholes. Many’s a time I’ve scanned a high/low/null-sec system and found a wormhole that leads to another notch on my killboard. Doing something else for an hour is good advice. Probably better than ‘collapse your static connection and start again’. I need to take that advice occasionally. For ladar and gravimetric, it is not so much the class of the wormhole that matter, but the type of site. A “Barren Perimeter Reservoir” ladar might actually be issuer to run in some class 6 wormholes than a class 1, thanks to increased wormhole effect. However, some ladar and gravimetric found only in class 5 and 6 wormhole needs a proper fleet (or a carrier) to clear them. Some only found in class 3 or higher wormhole might also be difficult to clear solo since Crucible; “Vast Frontier Reservoir” has 10 cruisers to clear since this change, including 6 neuting ones. Honestly any of the Ladars apart from the Core(Vital and Instrumental) can be solo’d in a Drake. The Vast Frontier Reservoir site is definitely soloable just takes a bit of kiting, the neuting cruisers are fairly slow so it’s easy to pick them off. The Core Ladar sites have the best gas but you need at least a pair of T3 cruisers and some skills to clear the sleepers. Or a friend with a carrier to help you out. Don’t forget to activate every single site before you leave your neighbors wormhole though. They really appreciate a clean wormhole!